As I packed for my first long-term trip in many years, I pondered my shoe choices. At age 26, as I started what turned out to be 3 years going half way around the world, I took one pair of leather sandals that had a good strap over my toes as well as an ankle strap and one pair of sneakers good for walking. (How well I remember those battered dirty sneakers.) Perhaps I had flip-flops. That was it. I liked this packing; nice and light. I’d later bought a pair of hiking boots in Italy. I carried them for 2 years, rarely wore them, and regretted their bulk and weight. However, when invited to a state dinner, I missed that opportunity due to lack of appropriate clothing and shoes — and I didn’t want that to happen again. You never know when an opportunity may come up and where it may lead. This time I wanted to be ready for those opportunities! So, for my 2012 trip, I gave my footwear a lot of thought. I wanted a pair of shoes that worked with a dress. My travel Aerosoles after over 1 year of being my only real shoe. I walked the streets of NYC shopping for and selecting a pair of flat Aerosoles. The women in each of the 3 Aerosoles stores I visited suggested a thicker-soled style for walking comfort, but I wanted my shoes to be as light as possible. (Plus as I’m tall I don’t like to add height.) The flat soft-of-MaryJane-like shoe I selected was not high-heeled fancy, but would get me by. These Aerosoles pressed flat against one another top-to-top and took up little room when wrapped in a plastic bag or fabric shoe bag. They fit well in the bottom section of my backpack, tucked around the side of my highly compressed down sleeping bag. In that way, too, they were a good choice. Sometimes I’d take them out and they were so squished that I felt bad for them, but they always sprung back into shape. If you’re curious as to how they held up over the many, many miles of walking, here they are, after over 2 years. Indeed, they did work for dress-up, although being flats, they looked somewhat stodgy with a dress. I wore them to synagogue and to whatever seemed business-like. But truth be told, I preferred the Brazilian-made plastic sandals I picked up in Costa Rica and they even looked fancier. However, the Aerosoles were better for my feet, by far. I alternated between the two shoes for “nice” occasions. 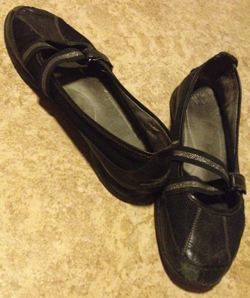 Right before I left, I acquired another pair of closed shoes — Skechers original GoWalk shoes. They, too, packed flat and they weighed next to nothing. They didn’t look good for dresses and in fact being the first model, looked a bit frumpy — but I’d hoped they’d supplement my use of the Aerosoles as daily walking shoes or sneakers for climbing mountains — and they did. I gave into taking yet one more pair of shoes: Merrell walking shoes that were quite boot-ish. They were great for mountains and were very comfortable, so the Aerosoles were off the hook a few times. But like the Italian hiking boots of yesteryear, I think I will live without them next trip. Now I’m considering shoes for my 2014 trip — leg two of my I-gave-up-my-homebase-to-travel adventure. Having been back in the USA for a year, I’ve donned those Aerosoles many a time. They’re well worn, but look good. Shall I bring the Aerosoles again? I know I’d like a new-style pair of Skechers that are more streamlined, if not dressier. Is there another brand that’s better? I’d really like a slight heel. I’ll still favor sandals and need to find a pair. In fact, I really want to try these Merrell’s Barefoot Life Flicker Wrap sandals. 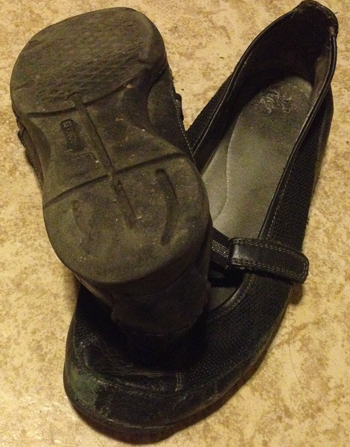 Bu I’ll still need appropriate-cover shoes for synagogue and other important places. ← Lost your glasses? How to See Without Glasses.